Edwin Levick, Passed and Waiting to Be Taken off Ellis Island, circa 1902–13. Note the railroad tags pinned onto the immigrants’ clothing. Courtesy of the Photography Collection, Miriam and Ira D. Wallach Division of Art, Prints and Photographs, The New York Public Library, Astor, Lenox and Tilden Foundations. 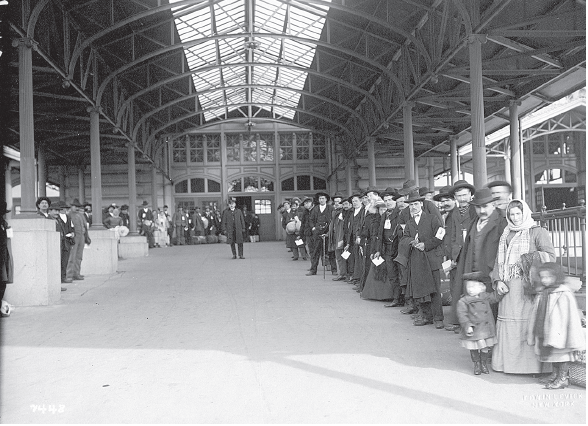 With immediate and unanimous agreement by the committee, Catherine Boland Erkkila’s creatively conceived, well-researched, and clearly written article, “American Railways and the Cultural Landscapes of Immigration” Buildings & Landscapes 22, no. 1 Spring 2015, was selected for the 2016 Bishir Prize. Erkkila’s work highlights the power of mobile landscapes of transit to define national identity at the turn of the 20th century. Building on studies that trace the spatial definition of race and gender along the railways, she focuses on the experiences of another group: immigrants. Like blacks and women, they were segregated from the general population in waiting rooms, on platforms, and in sleeping cars. Unlike other groups, however, immigrants underwent a transformative experience during their journeys in what she terms “the spaces in between”: a continuous series of shaped experiences from the coastal ports where they arrived to their final destination in the country’s interior. Erkkila traces their integration and assimilation into American society through theoretically informed analysis of material culture, architecture, and interior design. She draws on a treasure trove of primary sources, including first person accounts, redrawn railroad station plans, and railroad manuals. Both focused and broad in scope, it offers a wealth of material for several different research and teaching interests, and offers an important model for further research into historical and contemporary examples of racism, migration, and resettlement.